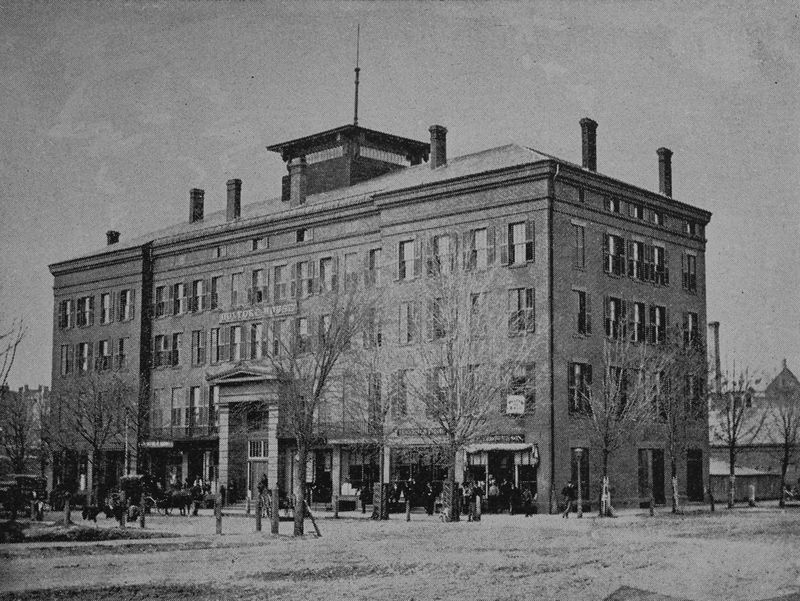 The Holyoke House hotel, at the corner of Main and Dwight Streets in Holyoke, around 1867. Image from Picturesque Hampden (1892). 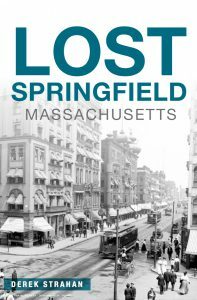 Until the mid-19th century, most of the present-day city of Holyoke was the sparsely-settled northern part of West Springfield, and was known as Ireland Parish. 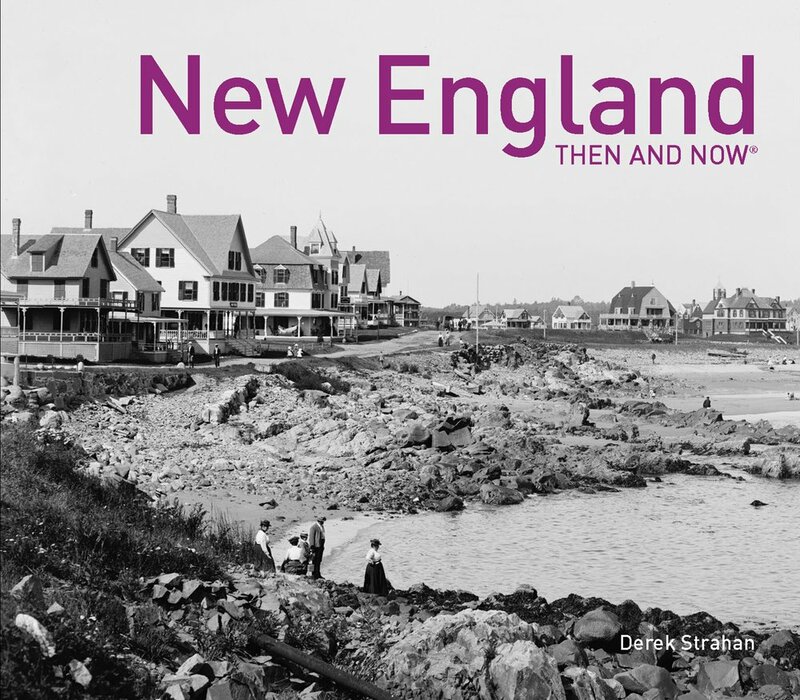 At the time, much of the population lived on or near Northampton Street, while this area along the Connecticut River – later known as the Flats – had only a few scattered homes. However, this began to change by the 1840s, as the Industrial Revolution made the waterfall on the Connecticut River an ideal site for large-scale manufacturing. A number of factories were built here starting in the late 1840s, and were powered by an extensive canal system that was built through here. Holyoke was incorporated as a separate town in 1850, and the Holyoke House hotel was built that same year, at a cost of $100,000. It was located at the eastern end of Dwight Street, just below the Second Level Canal, and it spanned the entire block between Race and Main Streets. At the time, there were still few buildings in the vicinity, but it was located diagonally across from the old railroad station, and within easy walking distance from the Lyman Mills and other early industries. Otherwise, though, Holyoke’s street grid was still largely empty, with an 1855 county map showing almost no development to the south or east of the hotel. However, these blocks would soon fill with factories and residential neighborhoods, and by the time the first photo was taken around 1867, the hotel was in the midst of a thriving manufacturing center. The hotel building has been heavily altered over the years, but the first photo shows its original appearance. It featured a symmetrical facade on the Dwight Street side, highlighted by a large two-story Greek Revival pediment over the main entrance. There were several storefronts on either side of this entrance, including the post office, which was once located here in this building. Originally, the building was only five window bays deep on the Main Street side, and it was topped by a low hip roof with a square cupola in the center. In 1889, extensive repairs and enlargements were made, giving forty extra rooms, an elegant dance hall and entrance, besides enlarging the post office, which is under the hotel proper, and with which direct communication is had by means of a chute from the hotel office in the main entrance hall, to the main room in the post office. This is the only hotel in the world thus equipped. It was convenient before, for the office was in the same building, but to write a letter and slide it direct to the mailing room is like a fairy tale. The hotel is equally convenient in other ways, having telegraph, telephone, barber shop and news room all under one roof. The finishings of the house are of the newest and best. Steel ceilings extend the length of the main corridor and ladies’ entrance and over the grand staircase, which is lighted by a light-hued clouded glass window. The side walls have been treated with a stippling brush and made artistic in finish. There are accommodations for 150 guests daily, the dining room having a seating capacity of 300 at one time. Six experienced chefs preside over the delicacies prepared for the table, and those who have enjoyed the hospitality of the house know their ability. Around the same time that this addition was completed, the Holyoke House was renamed the Hotel Hamilton. 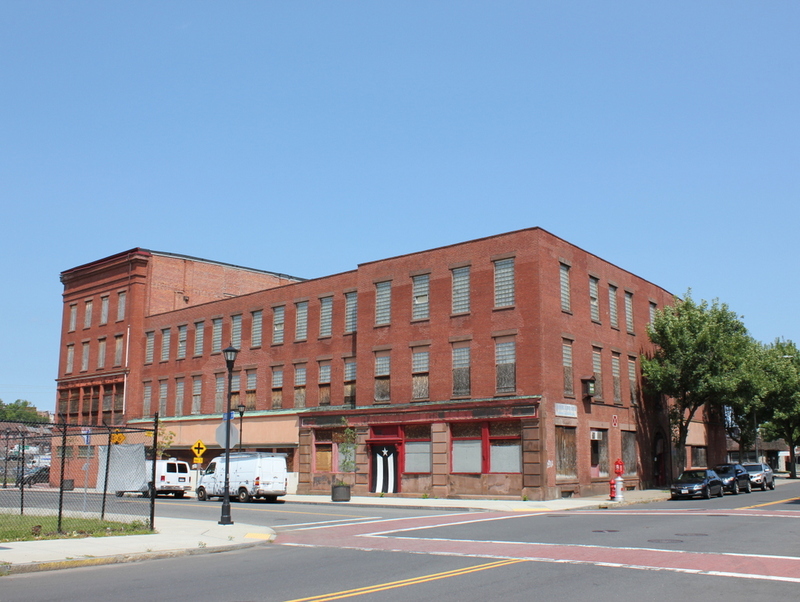 It would remain in operation for more than 50 years, during the height of Holyoke’s prosperity as an industrial city. However, the hotel finally closed in 1943, and several years later the building was heavily altered again, this time by removing most of the fourth floor. Only the Race Street side of the building retained its original height, and at some point the windows in the shortened section were replaced with glass blocks. The first floor has also seen considerable changes, including alterations to the storefronts and the removal of the pedimented entryway, and today the building hardly resembles its appearance from the first photo. Aside from the hotel, other 20th century tenants in this building included the Mechanics Savings Bank, which was located in the storefront on the right side for many years. The bank is long gone, but its name is still partially visible above the windows, and the old vault alarm still hangs on the Main Street side. Most recently, the building housed the Massachusetts Career Development Institute, and was known as the Silvio O. Conte Center, in honor of the congressman who represented Holyoke for many years. However, the MCDI moved out of the building in 2003, and it appears to have been vacant ever since.